Ireland, the golf enthusiast’s delight, is blessed with world-class courses in some of the most spectacular locations, both in Northern Ireland and in the Republic of Ireland. The Emerald Isle’s golfing credentials are sky-high, as it is home to a quarter of the world’s natural links courses, as well as is the location of choice for acclaimed events such as The Irish Open, The 148th Open (in 2019) and the Irish PGA Championship. Northern Ireland is home to a unique mix of wild coastal links and luxurious parklands, making it a prime golfing location. Follow in champion golfer, Rory McIlroy’s footsteps at Royal Portrush in Antrim, slated to host The Open in 2019. With three 18-hole golf courses along rocky shorelines, gorgeous strands and flowing rivers, it's no wonder it was chosen to host the prestigious event. Founded in 1888, the legendary Royal Portrush Golf Club is home to one of the most challenging links golf courses in the world – the renowned Dunluce Course and the smaller but equally enjoyable Valley Course. The leading golf destination is truly majestic: towering dunes, sweeping valleys and rough so thick only the greats can conquer it – which they will when The Open rolls into town in 2019. The North West Golf Course is indeed a hidden gem, presenting golfers with an extensive 18-hole experience, tucked amidst the rugged landscape of County Donegal, between the ‘Mouldy Mountains’ and the coast of the Swilly. Established in 1891, the course also fondly known as the “St.Andrews of Ireland” was one of the founding members of the Golfing Union of Ireland. It provides a welcome challenge to enthusiastic golfers, allowing them to enjoy an exhilarating game, set against a backdrop of panoramic views. Recognised world over as one of the greatest golf courses on the European circuit, the K Club located in County Kildare, played host to the Ryder cup. The course is known for its ability to put the skills of even the most experienced golfer to the test, as it pits players against the wits of the legendary Arnold Palmer, the namesake and designer of the golfing heaven. 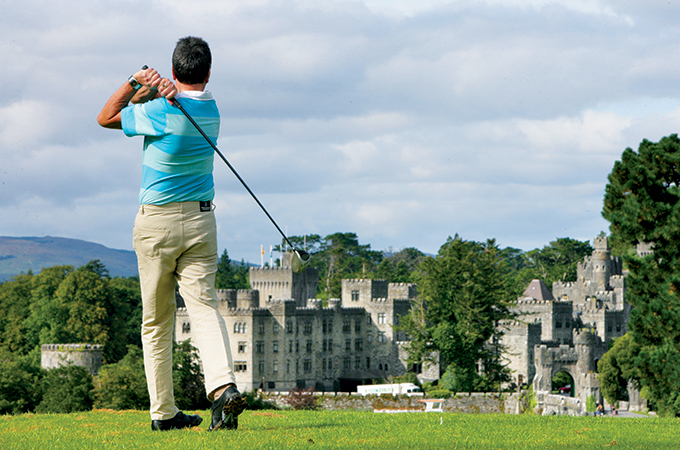 Waterford Castle Hotel and Golf Resort is one of the most acclaimed castle hotels in Ireland, having welcomed and charmed discerning travellers for decades. The castle is a legendary luxurious retreat of world class standing, offering superb castle accommodation near Waterford City. The island also hosts its own challenging 18-hole par 72 Championship Parkland Golf Course, designed by Ireland's golfing hero and twice Ryder Cup player, Des Smyth. Lessons can be arranged with the islands own Golf Pro, over and above other activities to entertain all the family, from clay pigeon shooting to curling up by a roaring fire. Those looking for a side of Ireland’s rich culture and history with their golf-dominated vacation will not be disappointed. Ireland is home to a number of beautiful castles and islands, each of which not only encompasses expansive courses, but also offers a variety of activities and attractions to be marvelled at. A touch of old-world charm is found amidst Ireland’s luxury castles, such as Lough Eske Castle, a restored Gaelic masterpiece that dates back to the 15th century. The castle-hotel carries a rich history, and today delivers superior hospitality and modern comfort. 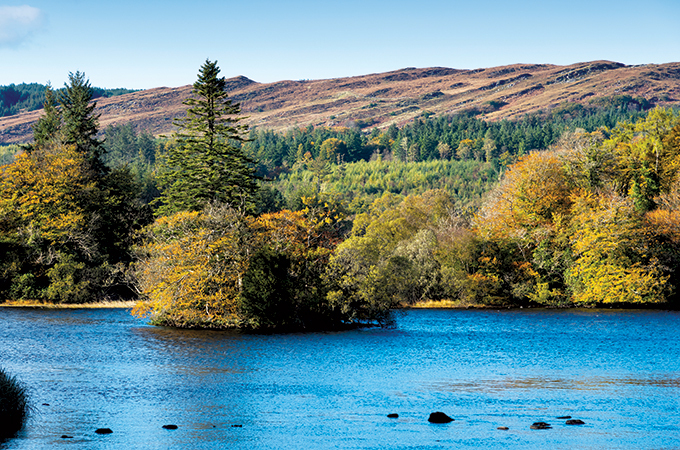 Situated between Lough Eske and the Blue Stack Mountains, the hotel is within reach of Glenveagh National Park, the International Appalachian Trail for walking, beaches for surfing and water sports, and uparalleled golf courses. These include the Narin And Portnoo Golf Club, an 18-hole links golf course with sweeping views of Gweebarra Bay and Donegal Golf Club, built upon a geologically significant 182 acres of land, bordering the Atlantic Ocean. Ashford Castle stretches across 350 acres, in County Mayo, on the shores of Lough Corrib and the River Cong with a spectacular backdrop of woodlands, lakes, river, and mountains. It features 85 guestrooms with several dining rooms, a bar, a cinema, a billiard room, a cigar terrace, a wine cellar, a spa and gracious afternoon tea service, amongst the many amenities offered. Guests can take long walks in the crisp air, play a round of golf on the 9-hole course (previously a deer park) or cruise on the estate’s lake. The Ashford Estate offers an extensive range of activities including Orvis fly-fishing to Ireland’s first school of falconry.